I'm like Sandy, I was guessing Hawaii. Mmmm, Hawaii?! I LOVE the red in the first. I'm so in love with the red and white scheme!! The first is a little busy for me. But I sure could sleep soundly in the second. they both look inviting and comfy. Makes me look forward to my trip to Hawaii in November! 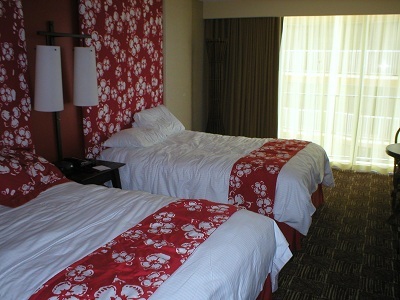 I've never seen a hotel that had a white bedspread lol. These are nice though! Nicest room I've ever been in--Four Seasons in San Diego. But the most beautiful was a B&B in a little town in Iowa. Not nearly as upscale but so lovely. Very pretty! I like the red and white decor. Thanks everyone for stopping by and commenting! 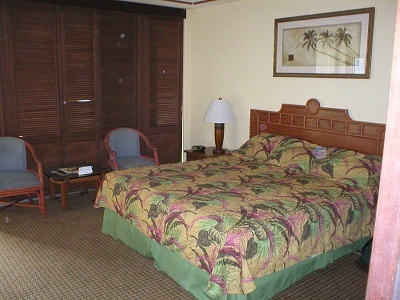 The hotel rooms are definitely Hawaii. The red and white one was taken in Honolulu while the other was in Kona.